Abandon the Web! : Is the Internet inevitable? 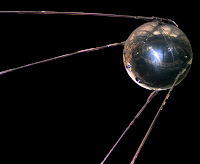 October 4th is the 50-year anniversary of Sputnik, first man-made satellite. DARPA creation was directly attributed to the launching of Sputnik. DARPA funded a number of projects, most notably ARPANET. The packet switching protocols developed with DOD grants form the foundation of the Internet. Were Space Race politics essential for constructing a unified global data network, or would Internet be built anyway—with or without Sputnik? As a thought experiment, imagine an alternate universe—without the Soviet Union. Without the Cold War. Without the motivation to create DARPA. With no ARPANET project, and no backbone to connect to. With research on packet switched networks being distributed among a number of entities, some commercial. Would a unified set of protocols emerge, or would the network evolve as a set of "walled gardens" that are loosely connected and weakly interoperable? On one hand, the benefit of a unified network for the users is tremendous. On the other hand, the short term interest of commercial entities often favors closed networks. Consider the mobile phone networks. Most of the world standardized on GSM, while the cellphone users in the United States are stuck with incompatible protocols. Recent events surrounding iPhone demonstrate how commercial interests are fighting with the users who want open networks. If you were transported to the alternate universe, would you be able to convince its residents to build the unified Internet? What arguments would you use? This is not an idle question. In our universe, there is plenty of convincing to be done—for example, there is no consolidated repository for social networking data. Maybe we shouldn't take the Internet for granted. If politics played out differently, we could indeed have "the Internets" instead of the single integrated network. Internet is inevitable absolutely. Year by year it's expanding all over the world. What will be further??? Even the net itself came from a desire to bridge disparate systems. If this had come from commercial instead of academic (DARPA funded) sources, might it have developed like early telephone or rail networks - not completely disconnected, but a very few "bridges" - all with steep tolls? I can't imagine it becoming a populist commodity. The desire to maximize monetization would prevent it from becoming a mass medium. Scarce is always more profitable. Who knows, maybe we would have had the internet sooner if it weren't for the Cold War. Or something better than the internet. All wars (cold or otherwise) waste a great deal of natural and human resources. All those smart people working for the government for decades could have come up with far more useful products and services had their talents (and the money used to pay them) not been required to defend us against Communism. It's very dangerous to give war credit for greatness. War is very destructive and what was lost in terms of ideas and progress because of it can not be measured.